William Brooks : Bitter Circus. Entrancing and ruggedly individualistic, earthy and ethereal songs. 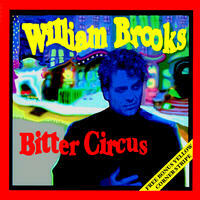 The most distinctive William Brooks album yet, Bitter Circus is solidly rocked out by this troubador and his band. There's a blusey drive here that reminds us of Bonnie Raitt's style of playing?a quality gets pushed further by Aaron Stroessner's (Dead Left) great guitar playing as well as piano from Peter Adams (Carly Simon, Julianna Hatfield, Tracy Bonham). Lyle Lovett's horn section sounds great on tracks like "My Love Looks the Other Way" and "Try It Like This." "Barn" and "Beggar" are standouts as well. License Entrancing and ruggedly individualistic, earthy and ethereal songs by William Brooks for your project. Play the music of William Brooks in your restaurant or store.